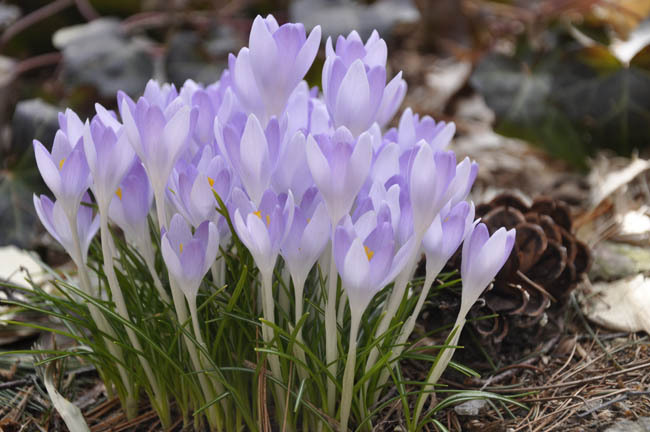 A mature clump of Crocus tommasinianus blooms near the studio entrance. When Easter comes in March, there is little in bloom out in the garden. Crocus, snowdrops and maybe some witch hazel is often all that there is, but in the greenhouse we were able to grab a mish mash, albeit it nice mish mash, of flowers to use in 8 little Weck canning jars which we ran down the center of our table along with a pile of fresh straw from the chicken coop. We dyed our own duck eggs and chicken eggs, except for a few duck eggs which I kept natural, as the olive green is nice enough. With 14 people for dinner today, we needed twice that amount for our annual egg fight. 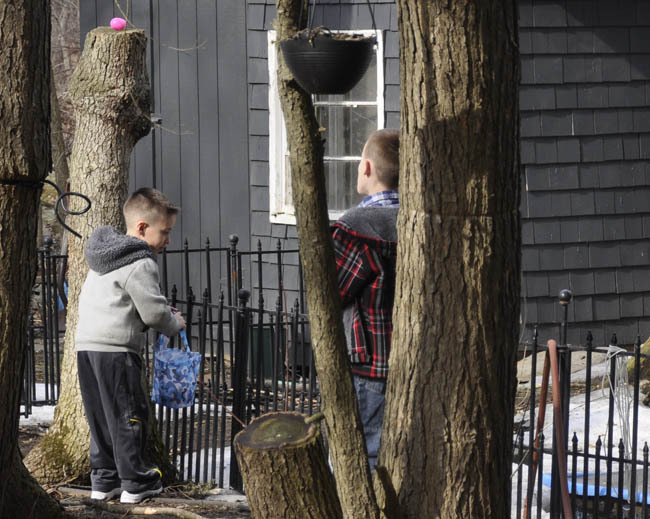 I was raised Lithuanian, as both of my parents are Lithuanian, so Easter is a big Holiday around here, with lots of tradition including my grandfathers Easter egg bread, leg of lamb with fresh herbs and of course – lots of Easter eggs. I never get sick of dying Easter eggs, I guess it’s a color thing. My mom would start saving onion skins around the new year, keeping the red ones separated from the brown ones, just so that we could have another color of dye. Red cabbage, beets and blueberries were also used, always on our own free range eggs. 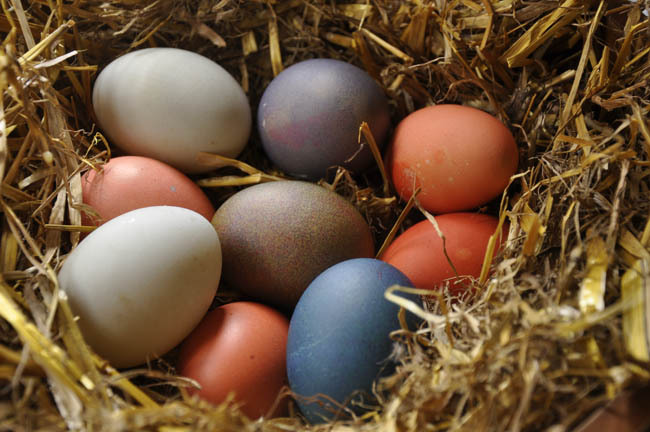 If Easter came in April, we would have had pigeon and pheasant eggs too, which always adds some scale to the baskets. An April Easter would also mean green grass, and lots and lots of spring bulbs to pick, but this year, as the snow is still melting, there is nothing much in the garden, as the ground is still frozen. but we are getting ready, as there is much to be done. 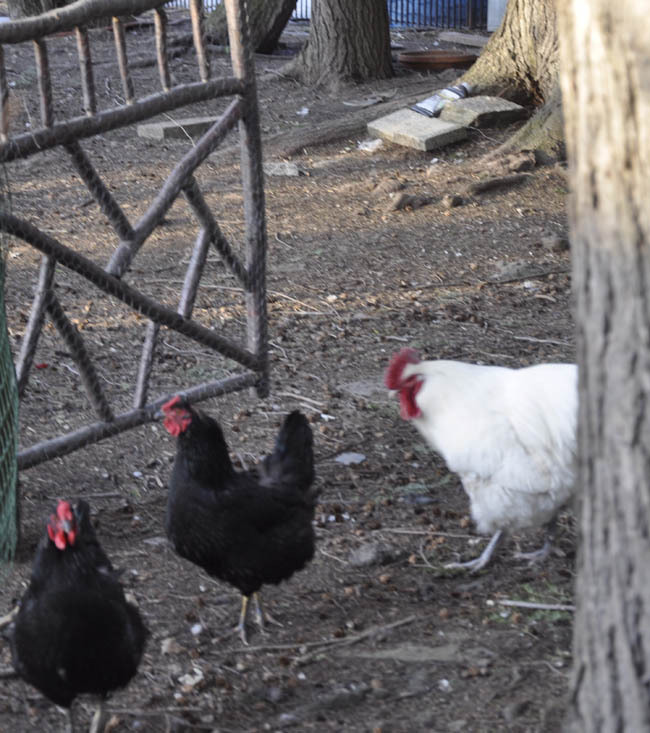 The chickens go out for a stroll, as we used the chicken yard for an egg hunt for the kids. Of course, the roosters and turkey toms attack them, but then, that’s part of the fun! These city kids needed to learn a thing or two about poultry anyway. No one was hurt, and later, although the kids insisted that they didn’t eat lamb, we just told them that it was chicken, and they ate it. 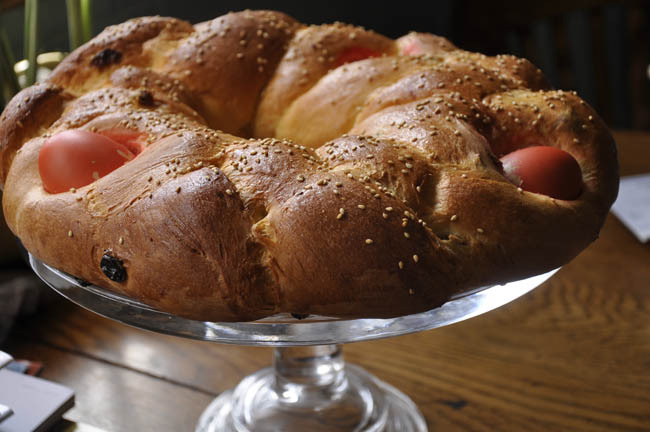 Every year, as my sister and brothers come for the holiday, I make Lithuanian Easter bread, a typical Eastern European egg bread with far too many eggs and even more butter. I alternate between my grandfather’s recipe, or our late neighbor Mrs. Putis. 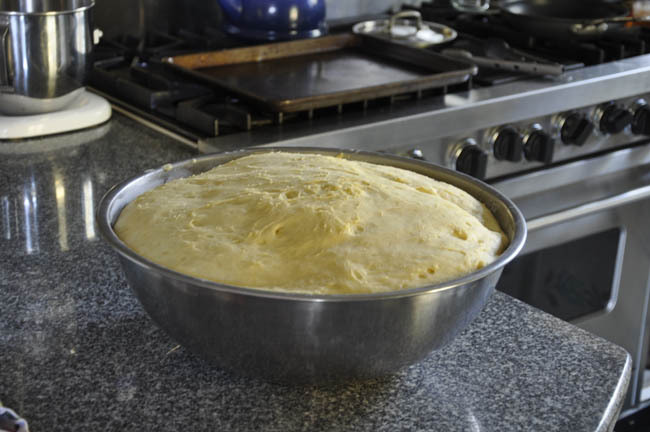 This year, I made Mrs. Putis’s recipe, which called for a little almond extract along with the vanilla, but then the lady across the street – an 85 year old Lithuanian, insisted that I should have used whiskey, as that’s what her father used. So next year – whiskey it is, as I am always up for any excuse for decent whiskey use in a recipe. I even braided one with the traditional three red eggs to represent the Holy Trinity. We aren’t religious, but tradition is tradition, and it must be done. 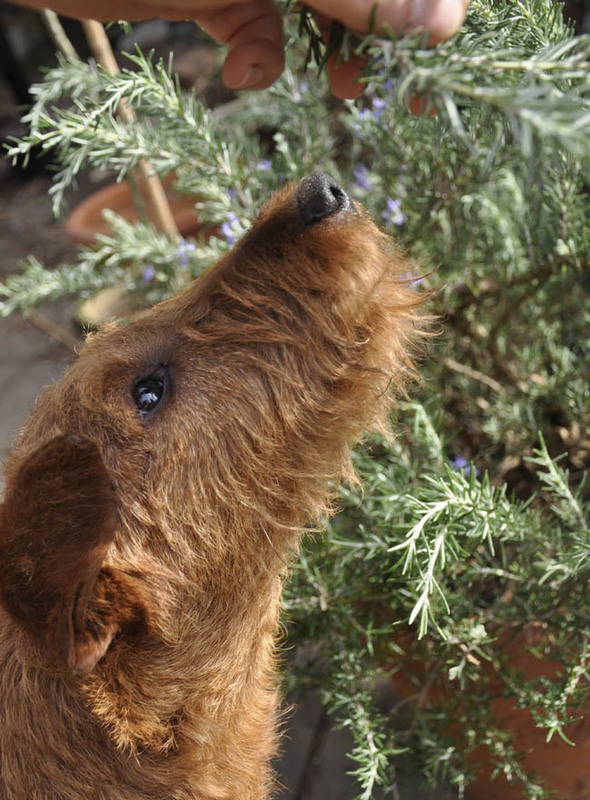 Weasley, the Easter Terrier, could not keep his snout off of the Rosemary shrubs once I brought them out from the greenhouse. Even the Prostanthera ( Australian Mint Shrub) was lunch for him. Rosemary is the herb of choice around here when Easter comes around. With Lamb on the menu, I needed a cup of Rosemary needles, and another cup for the roasted potatoes. 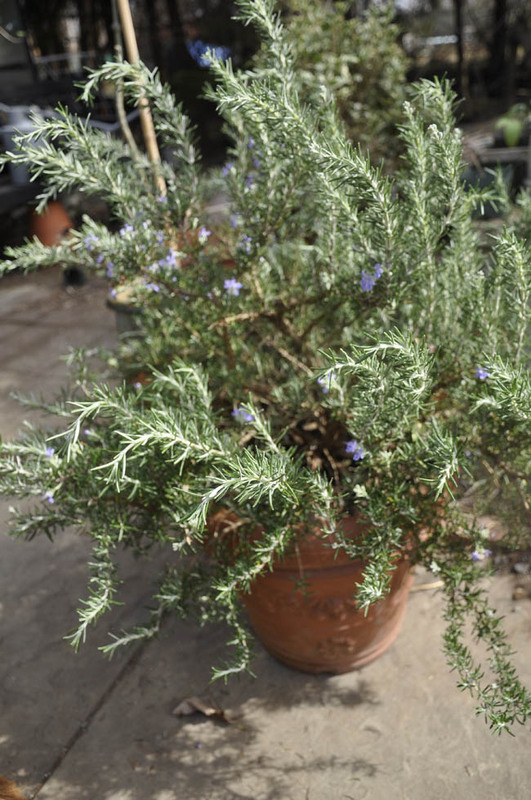 You Californians will think we are crazy here in New England, but we cannot grow Rosemary outdoors, so I keep a few large tubs in the greenhouse where it grows perfectly in the cold, moist air. 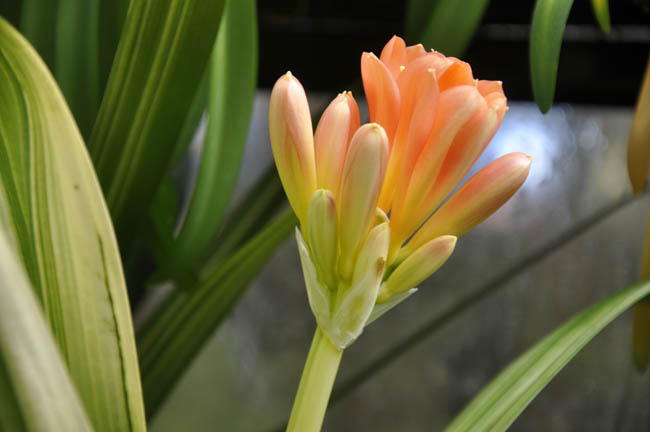 In the spring ( this week, actually), the tubs are brought outdoors where they can handle light frosts, even heavy freezes as long as the mercury doesn’t drop below 20º F.
In the greenhouse, the Clivia are beginning to blossom. This one is a variegated one. This prostrate rosemary is blooming already. I am bringing it outside for the season, as long as the temperatures stay above 20º. This one is my favorite for cooking because of it’s dense growth. The days are getting longer with the passing of each day. 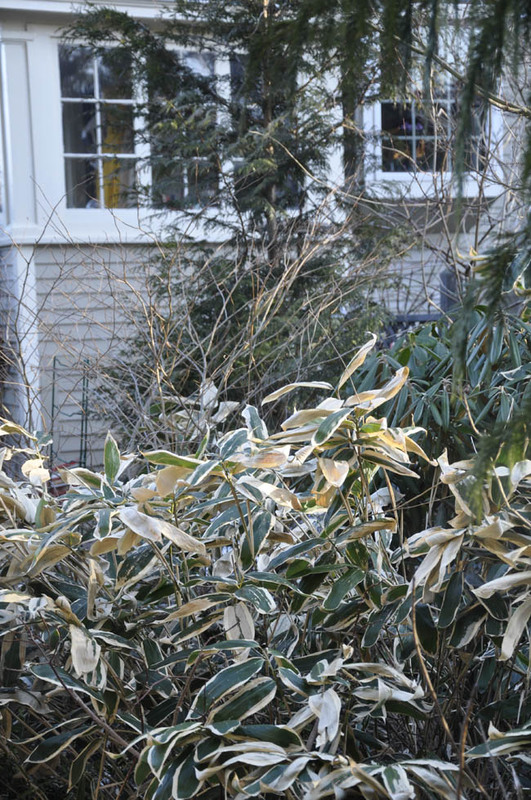 This afternoon, the setting sun illuminated the shrubs in such a way that I could appreciate their texture. 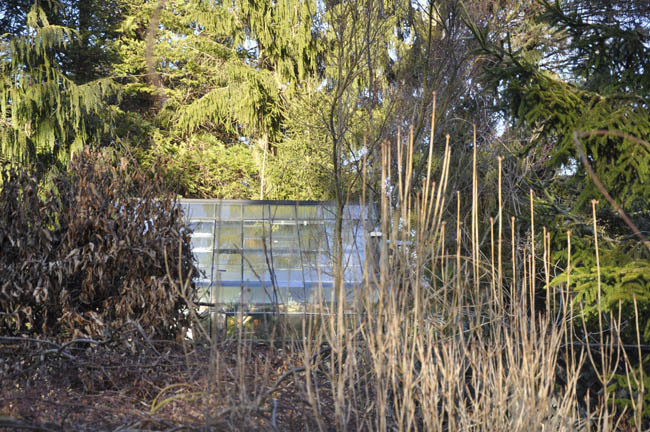 In the foreground, the vertical growth habit of an Enkianthus, just behind that, the brown leaves on the English Hornbeam hedge have yet to fall, staying on for most of the winter. 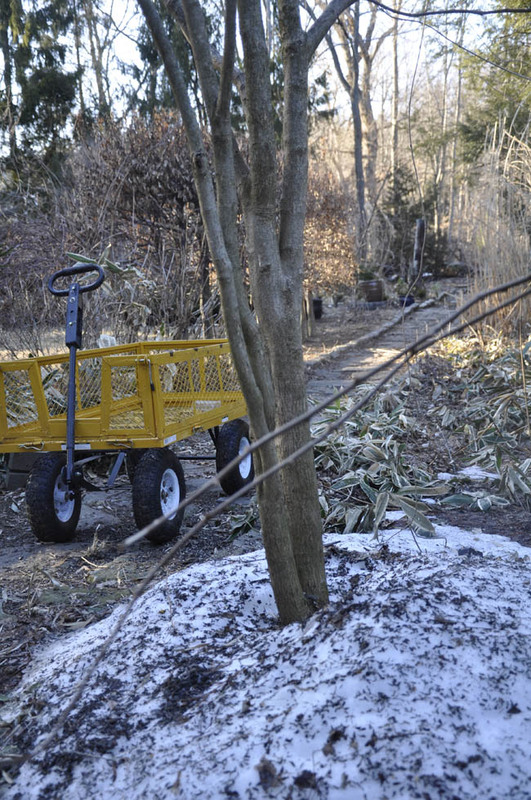 Our harsh winter has taken it’s toll on the Japanese forest bamboo ( Sasa vietchii) but it still doesn’t look that bad. The robins are singing, the birds are starting to gather nesting material, and perhaps, spring has begun to arrive.